The shuttered Publiq House bar and music venue on Freret Street is slated to be redeveloped into a modest-sized neighborhood grocery store, with a new condominium building constructed over the parking lot outside, developers told neighbors on Wednesday evening. The grocery store would take up the entire first floor of the Publiq House building at 4528 Freret, said developers with Green Coast Enterprises and Neighborhood Housing Services during a neighborhood meeting Wednesday evening. The upstairs would be still used for offices, including Neighborhood Housing Services as well as other nonprofits with similar missions. The condo building would be constructed over the existing parking lot, and include either 18 or 24 one- and two-bedroom units, they said. The one-bedroom condos would be about 600 square feet, and the two-bedrooms would be about 1,000 square feet, and slightly less than a third of them would be designated as “affordable” housing units. No tenant has been chosen for the grocery store yet, and the developers are waiting until the project has made it further in the permitting process before speaking to specific grocers. They do have a list in mind, however, said Will Bradshaw of Green Coast Enterprises — which had developed the Propeller business incubator and the South Broad Health Clinic, as well as the recently renovated Pythian Temple downtown. “If you want to know who we’re thinking about, ride around the city of New Orleans and see who’s operating small groceries in neighborhoods,” Bradshaw said. Because of the way the land use was configured for the Publiq House development, redeveloping the existing building to a grocery and adding a condo building with 18 units is already allowed on the site, developers said. Only the larger condo building, with 24 units, would require additional city action, because the rear area of the parking lot near LaSalle Street is zoned differently than the front of the site. Freret residents, like those in many other Uptown neighborhoods, have long clamored for a small grocery store nearby, and that aspect of the plan was fairly well accepted by the 25 or so residents in the audience for the meeting. “Having a grocery store would be an unimaginable luxury for a Tulane student,” said Brooke Rhea, a Tulane School of Architecture graduate student who lives two blocks away. The only concern expressed about the grocery was whether it will be priced affordably for residents to do their day-to-day shopping there, or oriented more toward a luxury goods. Similar-scale grocery stores are actually becoming more successful in cities nationally, Bradshaw replied. “This is actually a size that is rapidly growing in urban areas around the country,” Bradshaw said. The addition of the condo building, however, found far less support among the audience. 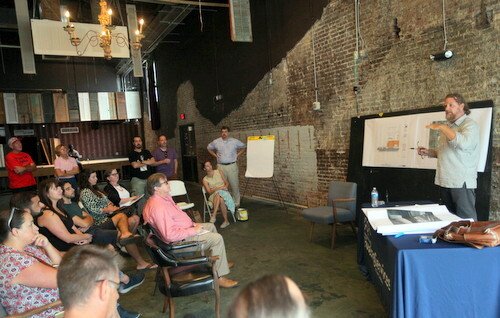 Residents and owners of existing businesses expressed a number of concerns, especially about its impact on parking on the already-crowded corridor. “I play hopscotch every day for parking,” said Juan Winsey, describing moving his car at 5 p.m. farther away in the neighborhood so his wife can park near their house when she gets off of work. The developers hired Urban Systems to do a parking study, who found that the city allows the development to count the on-street parking spots within the total it provides. City regulations would require that the development provide 41 parking spaces, and they found 42 on the site and adjacent to it, they said. The consultants also recommended ending the paid parking system in the lot, and simply reserving parking for people using the building during business hours, and making it open to the public in the evening. Michelle Ingram of Zeus’ Place said that while she supports re-use of the existing building, she believes the proposed mix of uses is too much for the site. She suggested choosing between either condos or offices, and putting that above the grocery without additional construction. Bradshaw said he has asked Mayor LaToya Cantrell’s new Office of Transportation to help come up with broader solutions to the parking issues on Freret.